“Old Turkey Feathers,” a flintlock Northwest gun, leaned against a cedar tree, an arm’s reach behind me. A bare patch on that tree, stripped away by an unknown buck, faced us. Three other rub trees lined the swamp’s edge to the south. The rub-line began in the little poplar grove, twenty paces out in the big swamp, upwind of the cedar trees. The crossing trail through the grove exited the swamp at the farthest rub, thirty paces distant. 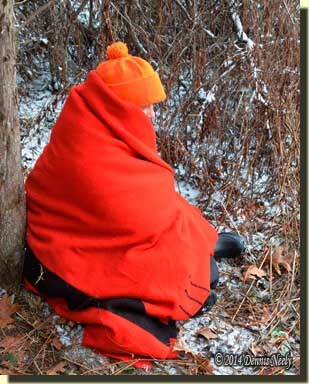 My daughter pulled a scarlet trade blanket tight about her body, then sat down on the snowy ground with her back to a different cedar. With a minimum amount of motion, I tucked the blanket under her crossed legs. All that showed were her eyes, nose and a black rubber boot tip. Eyes on full alert, she leaned forward. Her angle was much better than mine: she could see past the buck-rub cedar. I never saw the coyote, but as she whispered what she saw, I knew it would cross at the south island. The deep swamp grasses that hid the coyote also hid me. I shed the blanked, rolled up to my knees and rested Old Turkey Feathers’ forestock on the barkless trunk. The sear clicked. The razor-sharp English flint snapped to attention. The turtle sight hovered on the first clear opening on the southeast trail. “A clean kill, or a clean miss. Your will, O Lord,” I prayed in silence. The coyote crossed the first narrow opening at a fast walk. It was big and a dark charcoal grey in color. Much to my frustration, the underbrush was too thick for a clean shot. The turtle sight slid to the left, to a bigger clearing, just over the wooded mound’s crest. In the shadows I saw the canine veer to the north, choosing the trail that led to the thicket rather than continue on. I let out a deep breath. My daughter knew what that meant. It wasn’t ten minutes before skittish deer began milling at the west side of the cattails, due east of the island. One-by-one they left the swamp and returned to the far hillside. The wild turkeys putted their disapproval. “There it is, on the hillside again, by the fallen oak,” Kate whispered, referring to the coyote. The explosion of the coyote population is a real problem in this area, enough so that one of the few hunting rules on the North-Forty is: “if you have a good shot at a coyote, you take it. Even if it means you lose a chance at a buck.” That might seem a bit harsh, but chances to take out a primary predator like that mature coyote don’t come along very often. But traditional hunters have a responsibility to know their own limitations and the limitations of the black powder arm they choose to hunt with. Every time a woodsman decides to unleash a death messenger, he or she must consider the circumstance and weigh the percentages of making a clean and humane harvest. With Old Turkey Feathers the death sphere starts to “tail off” at 85 yards—taking a shot twice that distance is foolhardy and not respectful of the coyote. The island shot was maybe 60 paces, more than doable with the Northwest gun, but it just didn’t materialize like I hoped it would. And as frustrating as it is, waiting on a “best shot” that doesn’t happen is an integral part any hunting exploit, modern or traditional. Around Christmas a fellow traditional hunter hinted that he had a Civil War reproduction rifle sitting in his gun safe, and that it was for sale. He said it was a 2-band Enfield Musketoon. Any other Civil War rifle would not have attracted my attention, but the musketoon was a different story, and he knew it. In the mid-1980s, MUZZLELOADER magazine published a story entitled “Stylizing an EOA Enfield Musketoon Kit” (May/June 1984, pg. 65 – 67). That article always intrigued me, and I never forgot about it. The article’s premise was not just completing a mass-produced kit, kit-guns were real popular in that era, but doing so based on an imaginative scenario: a white renegade living among the Indians out West who somehow came to own one of the short, 2-band Enfield muskets. A “committee of experts” worked on that project, cutting down the barrel, reshaping the stock, finishing it, adding brass tacks and making a bag and horn that went along with the story. My retelling of the article and expressing a desire to distress this twice-shot rifle so it looks like “something found in a ditch” has met with a few, shall we be polite, “stern threats.” So for my Civil War re-enacting friends, relax. I’m now thinking perhaps the antiquing will be more acceptable on a Northwest gun? This raises a good point for all living historians: spend a lot of time researching primary sources and applying that knowledge to the creation of a persona. With that in mind, I have begun looking for “after war” images of Civil War rifles, especially the 2-band Enfield Mustketoons. Ideally, I’d like to locate and actual example for study. Right now, the gun looks “just out of the armory” new. Hard brush hunting will tone down that look and add “honest wear and tear.” And as I am learning, there are some authenticity issues with the reproduction itself, but that is to be expected. The question will be how far do I want to go with correcting the errors? In the meantime, I can’t wait to shoot the Enfield, to work up an efficient load and maybe compete with it at the Michigan State Muzzle Loading Association’s State Championship Shoot or at one of the National Muzzle Loading Rifle Association’s shoots at Friendship. I see a white-tailed buck in this gun’s future. In the 1970s I killed a running rabbit with a 500-grain, hollow-based Minie ball. I’ve got to try to duplicate that again, too. At the very least, the 2-band Enfield Musketoon will serve as an example of a good “settler’s gun” for someone just starting out in this hobby. In doing some preliminary research, I found mention of the Civil War muskets selling for $1.50 in the 1870s as “war surplus.” Although the reference is far from primary, it said many settlers, many of whom were war veterans, took these guns “west.” And right there is the start of a localized persona—relax, Bob, I’m not talking ditch gun here. I’m looking forward to resurrecting an idea from the past and expanding further my education in the wilderness classroom. At the very least, I see a lot of range time just over the horizon, when Michigan’s temperatures moderate. And if my eyes are good and I can muster a proper load, that coyote, or maybe some of his pals, might run into a death messenger slung from a stubby-barreled Civil War rifle. 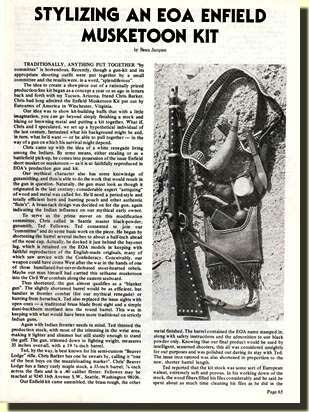 This entry was posted in Muzzleloaders, Varmint Hunts and tagged Black powder hunting, Dennis Neely, historical trekking, Mountain Man, North West trade gun, Northwest trade gun, trade gun, traditional black powder, traditional black powder hunting, traditional blackpowder, traditional blackpowder hunting, Traditional Woodsman. Bookmark the permalink. Your right Dennis,the old magazines are a WEALTH of info! I have Muzzleloader,Muzzleblast back to the mid 60’s, Buckskin Report, Tomahawk and Longrifle and a few more I read and re-read to get idea’s. I contacted one of the Magazines about re-running articles from the past and was met with copy right laws, and a whole slew of reasons why I couldn’t rather than working with me to make it happen. SO MUCH is in those old issues it’s a shame lawyers forbid you from using them unless you pay them to allow it. Sad sad sad. Good to hear from you! Yes there is a wealth of information in back issues, but they have to be read in the context of the time period when they were published, because some of the practices and accepted fact of that era no longer match primary documentation. Our “best understanding” is ever-changing. As a professional writer, the copyright laws protect my work product and help put food on the family table. Publishers contract to buy our stories for one-time publication, but the contract does not give the publisher any right to resell the article. If anyone wishes to republish a story, they have to contact the writer, not the magazine, and that is usually a person to person conversation with no lawyers involved. I hope that clears up this misconception. What made you choose the North West Trade gun? Your area was first settled by the French, who used fusils de trait, fusil de chasse, etc. Either would have been appropriate for your time period. What length barrel did you choose? My smoothbore started with a 42 incher but is now down to 36 inches. A friend of mine has a NWT gun with a 30 inch barrel which is pretty handy here in the mountains of north eastern PA. A long shot here is 75 yards, much beyond that you would be hard pressed to see an elephant. I wanted the versatility of a smoothbore so I could shoot round ball or shot. The choice was narrowed to a fusil de chasse, Brown Bess and the Northwest gun. I decided on the Northwest gun after reading Charles E. Hanson’s book, The Northwest Gun. I chose the 36-inch barrel because I hunt heavy brush. I’ve never been disappointed.